GPS-3 (Global Positioning System) or Navstar-3 (Navigation System using Timing And Ranging) are the first evolution stage of the third generation of the GPS satellites. 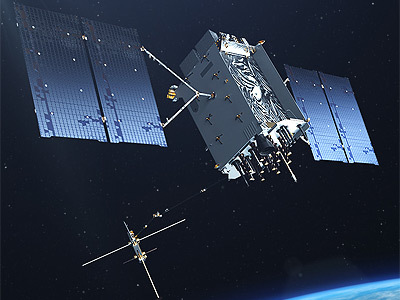 The U.S. Air Force announced in May 2008 that a team led by Lockheed Martin has won the competition to build the next-generation Global Positioning System (Navstar) Space System program, known as GPS III. This program will improve position, navigation, and timing services for the warfighter and civil users worldwide and provide advanced anti-jam capabilities yielding superior system security, accuracy and reliability. Under the $1.4 billion Development and Production contract awarded today by Secretary of the Air Force Michael Wynne and the Global Positioning Systems Wing, Space and Missile Systems Center, Los Angeles Air Force Base, Calif., the team of Lockheed Martin Space Systems Company, ITT Corporation, and General Dynamics, will produce eight GPS III satellites, with first launch projected for 2014. The development contract will result in approximately 500 new jobs for Lockheed Martin. When fully deployed, the GPS III constellation will feature a cross-linked command and control architecture, allowing the entire GPS constellation to be updated simultaneously from a single ground station. Additionally, a new spot beam capability for enhanced military (M-Code) coverage and increased resistance to hostile jamming will be incorporated. These enhancements will contribute to improved accuracy and assured availability for military and civilian users worldwide. As the program's Space System prime contractor, Lockheed Martin is leveraging its proven record of providing progressively advanced spacecraft for the current GPS constellation. The team designed and built 21 GPS IIR satellites for the Air Force and subsequently modernized eight of those spacecraft, designated GPS IIR-M, to enhance operations and navigation signal performance. For GPS III, Lockheed Martin's program management and spacecraft development effort will occur at its facilities in Newtown, Pa., with final assembly, integration and test located in Denver. The company's Sunnyvale, Calif., operations will provide various spacecraft components and a launch support team will be based at Cape Canaveral, Fla. Lockheed Martin's flight-proven A2100 bus will serve as the GPS III spacecraft platform. Unlike the GPS IIF satellite, the GPS III satellite feature an apogee propulsion system. ITT, Clifton, N.J. will provide the navigation payload, and General Dynamics Advanced Information Systems, Gilbert, Ariz., will provide the Network Communications Element (NCE) which includes the UHF Crosslink and Tracking Telemetry & Command (TT&C) subsystems. Originally, a block upgrade strategy was planned with eight GPS IIIB and 16 GPS IIIC satellites following, with each increment including additional capabilities based on technical maturity. The Air Force decided in 2011 to stabilize the GPS-3 production line before introducing upgrades to the system. The decision to not to upgrade GPS-3 according to a block schedule will remove constraints and allow for adding on the technology when the threat calls for doing so. In addition, the complexity of position, navigation and timing technology has evolved since the Air Force awarded the GPS-3 prime contract in 2008. Anti-jam capabilities are planned to be added to the system beginning with the ninth satellite. The first two satellites were ordered in 2008. Each two more followed in the years 2012, 2013, 2014 and 2016. Launch vehicles will be Atlas-5(411) or Delta-4M+(4,2) or Falcon-9 v1.2 (Block 5) rockets for single launches. Dual launches on larger rockets like Atlas-5(551) or Falcon-Heavy (Block 5) are considered for the 9th satellite onward.